(QCOSTARICA) President Luis Guillermo Solis announced his government will not take action against Uber until the courts have resolved a number of issues regarding open competitition in the taxi industry. Solis explained that the Constitutional Court and the Contentious Court (Sala Constitucional and the Tribunal Contencioso) need to resolve several filings proposing to remove the existing monopoly in the Taxi Act, that would allow open competition. 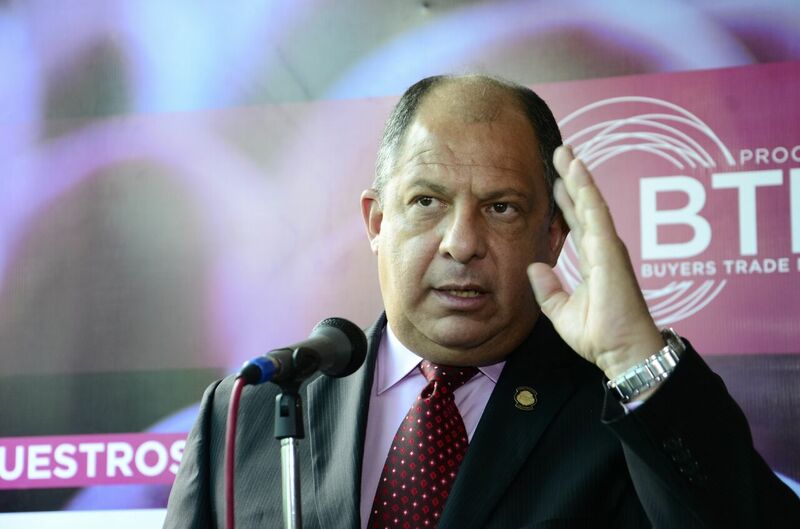 President Luis Guillermo Solis announced his government will not take action against Uber until the courts have resolved a number of issues regarding open competitition in the taxi industry. File photo. The decision or better, the lack of action on the part of the government, has the formal taxi drivers angry. Just last week a group formal taxi drivers once again took to the streets in protest against Uber and the government for doing nothing. Uber arrived in Costa Rica in August 2015, creating a revolution in the private transport of persons, going head-to-head with formal and informal taxi drivers who, to the complaint of users, have refused to provide a better service. Following the arrival of Uber formal and informal taxi drivers have taken to the streets in protest. On a few occasions the protest turned violent, taxi drivers in confrontation with police. Also a number of Uber drivers report being attacked by taxi drivers. Meanwhile, the government has being dallying, promising action, but doing nothing to resolve the situation. The announcement puts the issue in the deep freezer. “The government will take all decisions it needs to take once the legal entities, the Sala IV and the Contentious Court, resolve the issue of Uber’s operation in the country,” said Solis. The President explained that the current regulations “would indicate that Uber cannot operate,” but they (the government) cannot act on the regulation. “We would be acting outside the law (…) The rules of the State are being overtaken by technology itself. Two people agree to a transacted service. This is unprecedented!” said the president. The court resolutions may take up to 15 months of more, leaving the possibility that the Uber problem most likely will be passed on to a new governor in 2018. The online ride service seems to have found a market in Costa Rica. According to Uber it has more than 5,000 drivers operating in the country, with tens of thousands of customers using their service regularly. This has caught the attention of Uber competitors. One of them is Cabify, announcing earlier this month its touching down in Costa Rica. Although Cabify has yet to come out in force, the app(lication) already includes San Jose in its service coverage. Previous articleNo Soup For You!